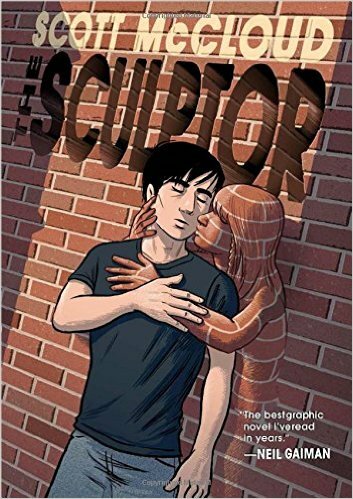 The Sculptor is a graphic novel written by American cartoonist Scott McCloud. The story is centered around David Smith, a struggling artist who is at the end of his rope. While getting drunk at a local diner, he meets his great uncle Harry, whom he recalls he hasn’t seen in ages. While the two are catching up, David realizes that his uncle is not exactly his uncle—he is Death incarnate. While struggling with this realization, he offers David the power to create anything with his hands – the catch is that he would only have 200 days to live. David accepts, thinking that this is his chance to get back into the good graces of the art world. However, things don’t work out they way David hopes for and he falls back into depression. He then meets Meg, an aspiring actress who takes him in, and he slowly falls in love with her. David now struggles with finding meaning in his art and his budding relationship with his fragile romance. The story was very straight-forward and simple. It is reminiscent of Christopher Marlowe’s Doctor Faustus because of the type of deal David agreed to do with Death. While it gets off to good start after the deal is made, I noticed how the story’s momentum slows down after his meeting with Meg. I know that the author crafted Meg’s character to serve as a foil to David’s: she’s outgoing and a risk taker, and he is cautious and quiet. While the relationship seemed interesting at first, I noticed, at different times throughout the comic, it becomes more of a filler as the story went on. Despite this, I liked David’s interactions with Meg as well as his conversations with other characters like Ollie, David’s close friend, Uncle Harry (Death), and even David’s internal thoughts. As far as the art goes, I found the color scheme to suit the comic very well. Though it’s mostly white, blue, and black, McCloud does a fantastic job with attention to certain details. (David’s sculptures and facial expressions). This panel above is one of my favorite scenes. I loved how McCloud has the cement stop in mid-air, as if David is stopping time, so that we can see the progress and beauty of the creations. McCloud’s color scheme invokes a somber atmosphere. It sets up the mood very well, with the lack of color is made up for in detail and the exaggeration in some of David’s artwork and facial expressions. This makes the reader appreciate the details in the graphic novel as well. In this panel, while it is just of one character, we see his many different faces all at once, like watching a movie clip. The Sculptor starts off well and becomes a bit stagnant in the middle, but the beautiful artwork and premise keep the reader interested to see how it all ends. McCloud forces the reader to answer some tough questions about a person’s purpose in life and what it means to truly live it. About the Author Scott McCloud: Depending on who you ask, I’m either comics’ leading theorist or a deranged lunatic, but life continues to be very interesting for me, and the ideas that I’ve raised continue to provoke reactions throughout the comics community and — increasingly — beyond it. Pick up Understanding Comics (or look for it at your local library) to begin finding out why.